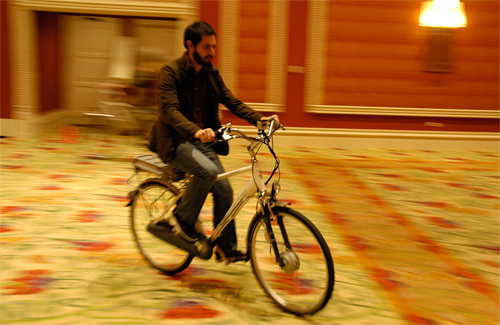 [CES 2009] Schwinn Tailwind Test Rides | OhGizmo! CES might appear to be a non-stop good time, but in reality, trying to cover as much stuff as you can while still getting enough sleep each night to remember your own name the next day can be a real challenge. But what keeps you running around the convention floor are the occasional opportunities to see or do things that very few have done before. 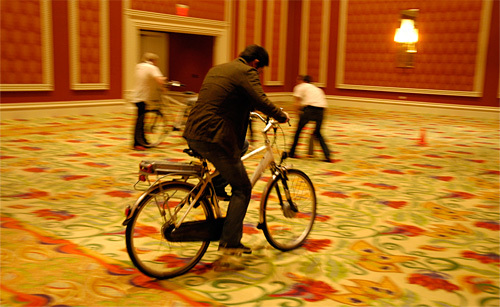 Case in point, at another ‘off-floor’ event, Schwinn not only had their Tailwind Electric eBikes on display, but they had reserved the next door ballroom so people could actually take them for a test ride. And in case you were wondering, the answer is no, that’s not me in the photos. But I’d like to thank that unknown member of the press for serving as our bike model.